Management literature has developed a slew of three-letter acronyms to refer to considering societal benefits as part of the assessment of business results. There’s CSR (corporate social responsibility), TBL (the “triple bottom line,” referring to social, environmental and financial performance) and the latest label of choice for public companies, ESG (environmental, social and governance concerns). These concepts are old hat in the family business world. Business families have been contributing generously to good causes for centuries. Closely held companies, free of the public markets’ pressure to increase profits each quarter, are especially well positioned to pursue non-financial goals in parallel with their revenue-producing activities. Many business families want to honor their ancestors by making an investment that perpetuates the founders’ values. A survey of representatives from large family firms in 21 countries, conducted in early 2016 by EY and the Center for Family Business at the University of St. Gallen (Switzerland), found that about two-thirds of respondents organize their philanthropy through a family-specific vehicle, such as a family foundation, trust or family office. But half of those surveyed said they also participate in philanthropy through the family business. 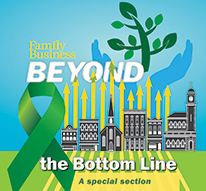 In this issue, we offer tips on doing good in a way that both achieves the family’s societal goals and promotes family harmony. In order for a philanthropic program to succeed, the family must approach it intentionally — just as they approach their business ventures. This involves measuring the effectiveness of the charitable contributions. In EY’s global family business study, 60% of respondents (on average) expressed a desire to enhance the evaluation of their philanthropic projects. In philanthropy, as in business, excellence won’t be achieved if people don’t take their jobs seriously or lack the skills to execute on a strategic plan. A family foundation should not be used as a means to dole out paychecks to unskilled relatives or as an attempt to remedy an entitlement mindset. Unfortunately, many families find that giving money away can generate as much intrafamily conflict as earning money does. This is especially true in large, far-flung families whose members have differing political or religious beliefs. It’s natural for long-surviving family foundations’ giving or investment patterns to evolve when a new generation takes the helm. The Annenberg Foundation, for example, moved its headquarters from Radnor, Pa. (a Philadelphia suburb) to Los Angeles after the death of its longtime board chair, Leonore Annenberg. Annenberg’s stepdaughter and grandchildren, living in Los Angeles and Paris, wanted to shift their giving to the L.A. area and away from Philadelphia cultural institutions. One of the most radical shifts has occurred at the Rockefeller Family Fund. Patriarch John D. Rockefeller founded Standard Oil, a forerunner company to ExxonMobil. In 2016, the fund announced that it would divest from fossil fuel companies. What’s more, David Kaiser, a fifth-generation Rockefeller family member, and Lee Wasserman, director of the Rockefeller Family Fund, wrote an article in the New York Review of Books decrying what they referred to as “morally reprehensible conduct” by ExxonMobil. Decade after decade, families continue to practice philanthropy as a group, rather than have individual family members pursue favorite causes separately. Good governance will smooth the way to good works.